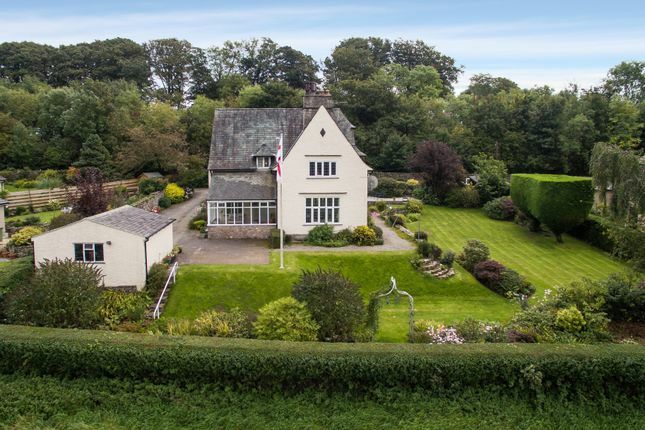 Tidal Reaches is an attractive Arts & Craft's styled 5 bedroom detached residence, designed by a pupil of the renowned architect Voysey, with a steep sprocketed roof and leaded windows that create an imposing first impression. Located in the village of Heversham, just outside Milnthorpe, the property boasts views that stretch across to the Kent Estuary, Langdale Pikes and the Lakeland Fells and it retains beautiful original woodwork within, including recessed pine windows with deep oak sills, skirtings, picture rails, doors and architraves. The spacious accommodation, whilst in need of modernisation in parts is ideal for family life. Set across four floors, there is a large entrance vestibule, three reception rooms, a home office, dining kitchen with adjoining utility, family bathroom and a total of five bedrooms, one of which is ensuite and a two room cellar. Surrounded by beautifully landscaped, gently sloping gardens with an array of colourful plants, shrubbery and trees, there is also a sizeable private driveway, detached double garage, shed and quaint outhouse mirroring the exterior of the property. Property descriptions and related information displayed on this page, with the exclusion of Running Costs data, are marketing materials provided by Fine & Country - Lancaster, and do not constitute property particulars. Please contact Fine & Country - Lancaster for full details and further information. The Running Costs data displayed on this page are provided by PrimeLocation to give an indication of potential running costs based on various data sources. PrimeLocation does not warrant or accept any responsibility for the accuracy or completeness of the property descriptions, related information or Running Costs data provided here.